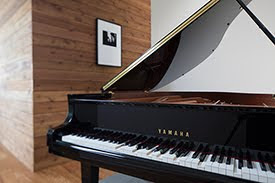 Yamaha MusicSoft is proud to announce the latest format of PianoSoft for Disklavier ENSPIRE. PianoSoft Audio is all-digital recording format that features stereo audio ensembles synchronized to piano performances. Unlike albums and traditional CDs, you can buy single songs of your favorites. You can buy them from the Yamaha MusicSoft website or directly through the ENSPIRE Controller App. Just like with all other formats of Yamaha PianoSoft, you can listen to original recordings of your favorite piano performances on your Disklavier. When these songs are played back, PianoSoft physically plays the piano – moving the keys to reproduce the original performance. It’s just like having a professional pianist in your home! As of today, Yamaha MusicSoft has 147 different song titles available for purchase, from artists like Elvis Presley, Bob Dylan, The Beatles, Elton John, Michael Bublé, and many more. We add more to the library weekly. If you have a suggestion for a new title, please add it in the comments below!